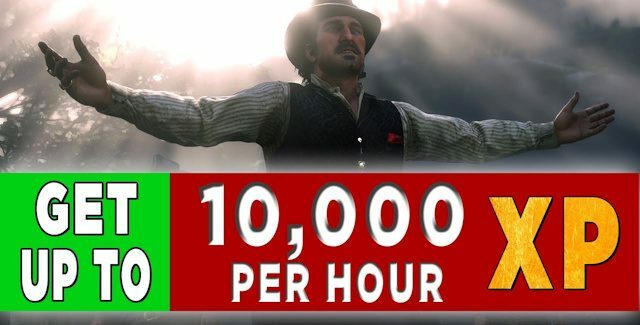 Welcome to the “Red Dead Redemption 2 Online: How To Level Up Fast Guide“. On this page we’ll show you an Experience Points Boost Guide, which explains how to get to max Character Level fast in Red Dead Redemption 2 Online with the right method to gain EXP Levels in the PS4 & Xbox One Western action-adventure online game. •	Step 1: Form a 2 person posse. Can’t be done solo and having 3 or 4 friends will still work but cut the XP earnings in half or more, so doing this with 1 friend is best (without a friend you cannot replay the missions anyway). •	Step 2: From the Progress Menu, select story mode and replay the “Kill Them, Each and Every One” mission. The Posse leader must have completed this mission previously and the second player must have completed at least the first mission. •	Step 3: Start Matchmaking. This will put you into a lobby intended for 4 players. As soon as you enter the lobby, QUIT by holding the CIRCLE button. Make sure you leave with Posse so your friend stays with you. •	Step 4: After a moment, you’ll see the yellow mission circle on your map for the starting point of the mission. Your posse must enter mission area together, best achieved by sharing a horse. •	Step 5: You’ll have an option to start matchmaking or start mission. Select “Start Mission” and your posse of 2 will play the mission alone. •	Step 6: Play the mission up until the final 6-8 enemies are left in the fort. Past that, a checkpoint occurs and a heavily armored shotgunner comes out. If that happens, you’ll need to let yourself die and start the mission over. Once you’ve done this a few times you’ll start earning XP very fast, up to 10,000 XP per hour! •	Make sure to always select the special ammo called Split Point. This gives you +5 XP per kill. With a weapon selected in the weapon wheel, use the d-pad to change ammo type. •	Always perform Execution kills whenever possible. Standard headshot kills with Split ammo grants 15 XP, execution grants 30. Ultimate Edition owners will get even more XP, up to 34 per Execution kill. •	Don’t worry about deaths since the checkpoint is just outside the fort anyways. I hope these XP exploit tips to level up fast will help you get you all maxed out.